Small or miniature toys can be tricky to have in the house with young children, my son is 2. But my daughter is getting to the age where she is wanting smaller toys. That is why I love these Potato Head Figures from Playskool, they are great for both of my kids! *I got the products listed below in exchange for my honest opinion of them. Mr. or Mrs. Potato Head? Why choose one when you can go with both? We ended up getting one of each, the Mr. Potato Head for our son and the Mrs. Potato Head for our daughter. In the Mr. Potato Head toy set comes with a knight, pirate, Viking and a samurai. All of the feet, arms, weapons/animals and headpieces can be removed. The Mrs. Potato Head set comes with a unicorn and three fairies. We have all of our potato heads, Mr. and Mrs., in one bag together so they are all mixed up. We have some fairy pirates, unicorn Vikings and fairy knights. My kids have so much fun using their imagination to think up new ways to switch around the accessories to make new characters. Since the potato heads are so small they are easy to transport. We take them with us every Sunday to church for our kids to play with. I even took them to my daughter’s gymnastics class to distract my son, who made a new friend while sharing them. If you’re not convinced yet why you should invest in these miniature potato heads than how about the $14.99 price tag or that it is recommended for ages 2 and up? 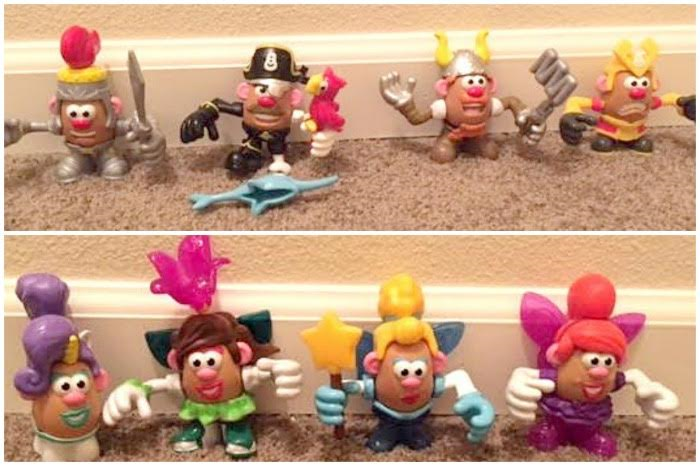 Who do you know that would love these potato heads in their toy bin?